OU PGCET 2018 #Results, Preliminary Answer Keys, Download the #OUCET 2018 Rank Cards,OU PG entrance results 2018, OU Entrance rank cards, OU results 2018: Osmania University, Directorate of Admissions, Hyderabad issued the PG Common Entrance Test(OU PGCET) 2018 Notification in April , 2018 for the academic year 2018-2019. OUCET M.P.Ed. Results are available. OUCET MPEd Rank Cards are available. 2. Submission of applications commence from: 21-04-2018. 3. Last date for submission of online application Without late fee: 19-05-2018. OU PGCET 2018 for Admission into various post graduation courses, PG Diploma courses and 5 years Integrated courses in the Osmania, Telangana, Mahatma Gandhi and Palamuru University in the campus, constituent and affiliated colleges for the academic year 2018-2018. Osmania University is going to invite the online applications through its official web portal from the eligible candidates who have passed or appearing for the final year examination for entrance tests and admission into various pg courses may be in April / May 2018. OU CET 2018 applied Candidates to be appeared the entrance exam, which would be held in June first week, 2018. The results of OUCET 2018 would be announced in June last week, 2018 at University Guest House by 12.30 PM. After announcement of results, it has been uploaded the results along with rank cards on University web portal. So, candidates can check their results from this website. Osmania University Common Entrance Test (OUCET) 2018 results will be declared online in June last week. Candidates can check their results on www.oucet.ouadmissions.com or www.osmania.ac.in. An official media release on Thursday informed that the results would be declared by the registrar on the university campus in the presence of deans and principals. candidates appeared for admission in 45 different post-graduation courses. The exams to be held in June last week, 2018. The students who have appeared for the common entrance tests have cleared the OUCET. The rank cards of candidates have been made available on the website www.osmania.ac.in and www.ouadmissions.com. The Osmania University to be released the results of 46 entrance tests held for admissions into various PG, PG Diploma and five-year integrated courses of Osmania, Telangana, Mahatma Gandhi and Palamuru Universities. Going by subject wise results, all the candidates who had appeared for the MEd course have cleared. Some of the courses like Urdu, Psychology, Arabic, Linguistics and Hindi have received less than 500 applications this year. In fact, Kannada, Marathi, Persian, PGD in applied linguistics, PGD in Functional Hindi and Translation and PGD in Urdu Paleography have got less than 20 registrations. As a result, no entrance examination was conducted as applicants were less than the number of seats. Now, The university administration intends to start web counselling and a notification for web counselling and certificate verification will be issued soon. 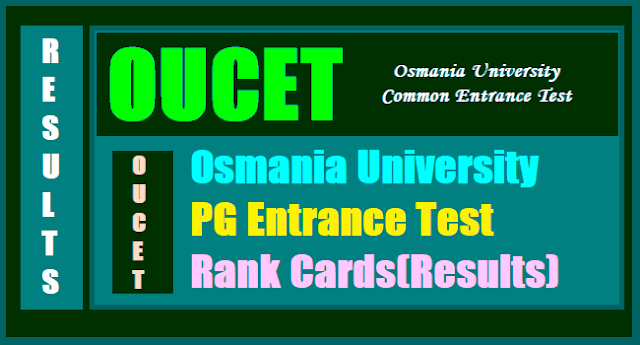 OUCET Web note: All the candidates who have appeared in OUCET 2018 entrance tests are hereby informed that the preliminary answer keys corresponding to subjects to which entrance tests were conducted are available in the websites, www.osmania.ac.in and www.ouadmissions.com. The candidates are advised to go through the keys and in case of any objections, they may be submitted in writing, with supporting material if possible, to the Director, Directorate of Admissions, Osmania University on or before ......06.2018 by 4.00 pm. The OUCET 2018 Results to be released soon on website for admission to PG courses in the Osmania University. The PG courses admission will be done through OUCET in Telangana, Palamuru and Mahatma Gandhi universities . The results are available on OUCET website only. Osmania University has declared the Osmania University Common Entrance Test, OUCET 2018 results. Students who appeared in the online entrance examination for Osmania University admission to different undergraduate, postgraduate, diploma level programmes. The official website to check the OUCET Result 2018 is oucet.ouadmissions.com. Rank cards for Osmania University results are now available for download. Candidates who have qualified the exam will be eligible for admission to postgraduate, PG diploma and five-year integrated courses offered at Osmania, Telangana, Mahatma Gandhi and Palamuru Universities. The counselling process would begin shortly. Last year, the same began on July 7. The computer-based examination was conducted from June 4 to June 13th. Steps to check Osmania University Entrance Test Result 2018: Log on to oucet.ouadmissions.com. Direct link to check OUCET Result 2018 has been given here. Under the Application section, click on the link saying Download Rank CardEnter OUCET hall ticket number, Registration number and date of birth in DD/MM/YYYY format and click on View Rank Card. Your result would be displayed on the screen. Save and print for future reference. Rank cards would be required at the time of OUCET counselling 2018..
1. ఉస్మానియా యూనివర్సిటీలో వివిధ పీజీ కోర్సుల్లో ప్రవేశానికి నిర్వహించే ఓయూసెట్ - 2018 పరీక్షలు బుధవారంతో ముగిశాయి. 2. రోజూ మూడు విడతలుగా ఈ నెల నాలుగవ తేదీ నుంచి 13వ తేదీ వరకు ఈ పరీక్షలను నిర్వహించారు. 3. ఓయూసెట్ ద్వారా ఓయూతో పాటు మహాత్మాగాంధీ, పాలమూరు, తెలంగాణ, తెలుగు విశ్వవిద్యాలయాలలో పీజీ సీట్లను భర్తీ చేయనున్నారు. 4. ఈ ఏడాది తొలిసారిగా ఈ పరీక్షలను ఆన్‌లైన్ విధానంలో నిర్వహించారు. 5. రాష్ట్రవ్యాప్తంగా పాత పది జిల్లా కేంద్రాలతో పాటు హైదరాబాద్, రంగారెడ్డిజిల్లాల్లో మొత్తం 25 పరీక్షా కేంద్రాలను ఏర్పాటు చేశారు. 6. ఈ పరీక్షలకు మొత్తం 61,500 మంది అభ్యర్థులు హాజరయ్యారని ఓయూ డైరెక్టరేట్ ఆఫ్ అడ్మిషన్స్ డైరెక్టర్ ప్రొఫెసర్ తెలిపారు. 7. పరీక్షా ప్రశ్నాపత్రం కీలను రెండు రోజుల్లో విడుదల చేస్తామని ప్రకటించారు. వాటిపై ఏవైనా అభ్యంతరాలుంటే తమ కార్యాలయంలో సంప్రదించాలని సూచించారు. 8. రెండు వారాల్లో ఫలితాలను విడుదల చేస్తామని తెలిపారు. Step 8 - preserve the rank card for future reference at the time of counselling. 1. The admissions into PG Courses offered by Osmania, Telangana, Mahatma Gandhi, Palamuru and Potti Sreeramulu Telugu Universities (in campus, constituent and affiliated colleges) will be made through a centralized web counselling. Further, the subject wise, rank wise schedules will be available in website. The qualified candidates are advised to visit the website time to time for further admission schedules. Websites: www.ouadmissions.com , oucet.ouadmissions.com and www.osmania.ac.in. 2. The eligibility of the candidates is not verified / decided at the time of application and during the entrance test. The verification will be done only during the admissions. Hence, candidates are advised to ensure that they are eligible for the course/subject they are applying for admission. 3. The candidates called for certificate verification must bring the following original certificates /documents along with two sets of xerox copies. ii. Transfer Certificate (T.C) from the institution where the candidate has last studied. iii. Degree certificate and complete memorandum of marks or consolidated memo of qualifying examination (the downloaded memos are not allowed). The candidate should ensure that he/she has passed the qualifying examination with requisite percent of marks without which his/her admission will not be entertained. iv. Secondary School or 10th std. Certificate. v. Proof of Local / Non-Local status of the candidate as per the rules in force. vi. Community / Caste Certificate if applicable. vii. Latest Income Certificate issued by Tahsildar on or after 01.01.2018, if applicable. viii. Certificates of NCC/NSS/ Sports, CAP, PH, Teacher and Lab. Assistant Categories, if applicable and when called for admission under these categories. 4. Along with the above, the candidate must bring one of the following original identity cards of him/her along with two xerox copies. i. Indian Passport. ii. PAN Card. iii. Voter Identity Card. iv. Indian Driving Licence. 5. In addition to the above, the candidates must also bring three passport size photographs which are similar to those uploaded during online application.